The White's Tree Frog a.k.a. The Dumpy Frog has a reputation as a big laid back frog with an even bigger appetite! Prone to obesity in captivity, care should be taken not to over feed the White's Tree Frog. 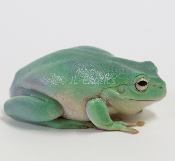 White's Tree Frogs can be found in Australia, Indonesia, snd Papua New Guinea. The animals offered are Blue phase - meaning they will appear a nice cobalt blue when mature. However, the White's Tree Frog and easily and quicky manipulate it's color based upon stress, temperature, and/or mood. It is not common to see brown, green, and blue frogs all in the same tank at the same time. Female White's Tree Frogs can reach ~ 4" in length and the males are typically smaller in the 3" range. Because of their laid back and fearless nature, the White's Tree Frog is probably one of the best tree frogs for a young enthusiast as they appear to be better equipped for some level of handling and are forgiving of some husbandry errors. Big, easy to care for, and beautiful - the perfect frog for any pet keeper!